HEYBURN — The city of Heyburn is under a consent order by the Environmental Protection Agency to bring its wastewater treatment plant into compliance or face fines that could ruin the city. The improvements needed are estimated at $7 to $8 million, and the city will need a bond to help pay for them. “We have no choice, we have to do this,” said City Administrator Tony Morley. In a draft consent order, the EPA said the city must have the first phase completed by June 19, 2020, and the second phase done by May 31, 2022, or face fines of $53,484 per day. The first phase consists of the installation of a new UV disinfection system, including a new generator to provide emergency power and the installation of a screw press for solids handling. The second phase consists of upgrading the clarifier system, including the installation of a third clarifier for redundancy and adequate hydraulic and organic capacity. The city’s collection system and lab building also need upgrades, but those are not included in the consent order. Morley said the city has struggled with compliance at the plant since 2014 but has worked with the EPA to take care of most of the violations. The system was taxed during the 2016-2017 flooding when flood water infiltrated the waste treatment system, said wastewater treatment plant manager Ralph Martini. During the flooding, more water went into the system than the clarifiers were designed for and solids went over the top and were discharged, Martini said. “Right now we can’t even shut one clarifier down to work on it,” he said. There is no redundancy built into the wastewater system, and that needs to be corrected, Morley said. The solids are now dried naturally, and the system is weather dependent, which means it can back up. A screw press for the solids handling will be added. “It won’t depend on the weather, and once we are caught up, we will be caught up,” Martini said. The plant has 596 violations, which occur when the discharge of phosphorous exceeds certain levels. What are the bond options? Because the city is under a mandate to bring the plant into compliance, the city will have to pursue a bond issue. The two options for a bond are through the election process or by judicial confirmation, where a judge issues an order for the bond. The city must take action to bring the plant into compliance with the EPA, Mayor Cleo Gallegos said. “We will do what’s best for the city,” Gallegos said. The City Council will likely make the decision on which route to pursue during its business meeting on Wednesday. The meeting begins at 7 p.m., at City Hall, 941 18th St. The Council will also hear a presentation by Zion’s Bank that will outline the bond details. If the Council chooses to use an election and residents don’t approve the bond, the city would still be required to move forward with a judicial confirmation. The last upgrade at the wastewater facility was in 2009, and the city is stilling paying for it. The 2009 project included a new oxidation ditch and belt-press solids handling system, installing an anaerobic bio-selector tank and filters and upgrading the headwork’s building and equipment. It cost $6.16 million, paid for with the city’s $5 million bond issue, grants and city funds. The city will likely wrap the existing and new bonds together, Morley said. “We just don’t have all the details on it yet,” Morley said. So far, the city has spent more than $100,000 through grant funds for the needed studies. The system is running near capacity, which means a halt for economic growth until more capacity is added, Morley said. “The city is on the cusp of tremendous economic growth,” he said. 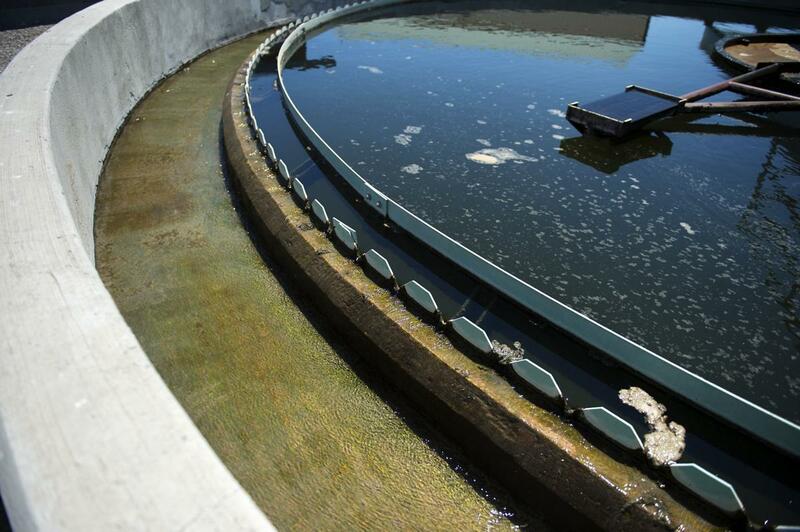 The engineering firm hired by the city to perform the wastewater studies recommends that the city allow no more economic growth until the plant’s capacity is increased. “That puts us in a really tough spot,” Morley said. But the violations can’t be fixed without increasing capacity at the facility, he said. The improvements will more than double the capacity. By law, cities have to make sure the revenues for enterprise funds, like water, wastewater and electrical, cover the costs of the services. “You can’t cover those out of the general fund,” Morley said. The city has 3,300 residents, and “we’re talking about putting $8 million on their backs,” he said, noting that city officials never want to raise utility rates. “We realize it makes it tougher for people who are on a fixed income,” he said. Morley said the City Council began preparing for the increased costs in January by implementing incremental rate increases for water and wastewater. Water rates will increase 28 percent and wastewater will increase 18 percent. The City Council plans to conduct public outreach beginning this month, and information will also be mailed to residents. Council members may also go door to door and talk with constituents. “Good leaders have to make good long-term decisions,” Gallegos said. Published: July 9, 2018, 11:15 a.m.